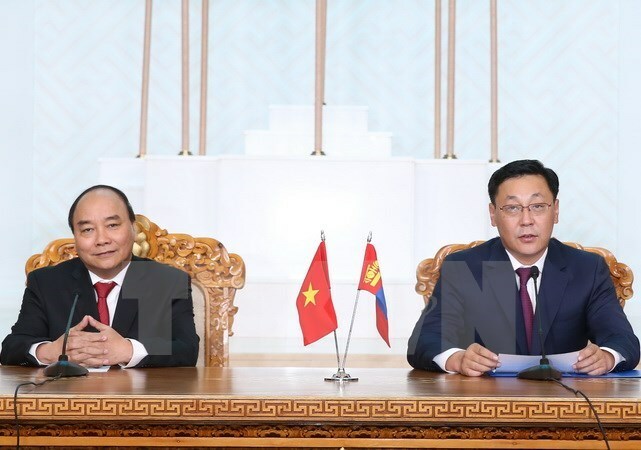 Ulan Bator (VNA) – Prime Minister Nguyen Xuan Phuc and his Mongolian counterpart Jargaltulga Erdenebat exchanged notes on measures to intensify the two countries’ relations, especially in economic and trade cooperation, at their talks in Ulan Bator on July 13. PM Phuc, who is in Ulan Bator for an official visit and to attend the 11th Asia-Europe Meeting Summit, congratulated the Mongolian Government and people on their achievements during their nation-building process. Vietnam treasures and wishes to strengthen its multi-faceted cooperation with Mongolia, he affirmed, believing that the 11th Asia-Europe Meeting Summit will be a success under Mongolia’s chair. Both PMs agreed to continue promoting political trust and mutual understanding through delegation exchanges, while stepping up cooperation in security and defence. They reached a consensus on speeding up the signing of cooperation agreements and increasing the efficiency and role of the Vietnam-Mongolia Inter-Governmental Committee. They also discussed measures to facilitate goods transportation between the two countries in order to raise their trade turnover, and to early achieve mutual recognition of hygiene quarantine standards on Vietnam’s farm produce and Mongolia’s meat products. The two PMs agreed to expand cooperation in potential fields like agriculture, mining, light industry and pharmaceuticals. Vietnam asked Mongolia to receive more Vietnamese workers and create favourable conditions for their enterprises to intensify trade exchange, while Mongolia welcomed Vietnamese businesses to invest in oil exploitation and mining in the country. The two sides affirmed the need to boost people-to-people diplomacy as well as cooperation in culture, sports and education, and support the Vietnamese community in Mongolia and the Mongolian community in Vietnam. Both PMs expressed satisfaction at the close coordination between the two nations at regional and international forums, such as the ASEM, the ASEAN Regional Forum and the United Nations Educational, Scientific and Cultural Organisation, while discussing shared issues, including the East Sea issue. The Vietnamese PM took the occasion to invite PM Erdenebat to visit Vietnam. The latter accepted the invitation.